Yesterday the Flickr blog announced that the Keene Public Library has joined the Flickr commons. I’ve been watching the library’s photo stream for a few years now, as its archive of historical photos and postcards and has been steadily and carefully uploaded, described, cataloged, and tagged. Last weekend I went rock climbing with some friends at the Stone Arch Bridge and wondered what it looked like when the trains ran. Here’s a postcard that answers the question. 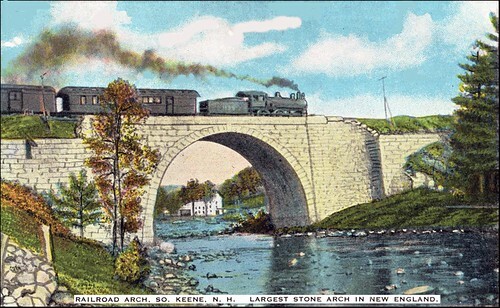 Postcard of the Cheshire Railroad Bridge (Stone Arch Bridge) in Keene New Hampshire, also called the Keystone Arch Bridge. The bridge had a 90 foot span and was 60 feet high at the center of the arch. Author Jon UdellPosted on 15 Jun 2010 15 Jun 2010 Categories . Previous Previous post: To PIP (picture-in-picture video) or not to PIP?